William Morrow Paperbacks, 9780062120328, 368pp. 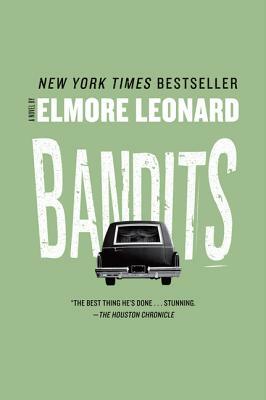 A wild ride with “the coolest, hottest writer in America” (Chicago Tribune), Bandits has everything Elmore Leonard fans love: non-stop thrills, unexpected twists and turns, unforgettable characters, and the most razor-sharp dialogue being rapidly exchanged anywhere in the crime fiction genre. Leonard stands tall among the all-time greats (John D. MacDonald, Dashiell Hammett, James M. Cain) and towers far above most of the writers currently plying the noir fiction trade. The master who created U.S. Marshal Raylan Givens, currently of the hit TV series Justified, is at the top of his game, ensnaring readers in an ingenious plot hatched by a former jewel thief and a radical ex-nun to scam millions from a sadistic Nicaraguan colonel. In fact, the Philadelphia Inquirer says Bandits “may well be his best.” Read it and decide for yourself.